I recently went on a Great Plains adventure for my sister’s wedding, which was gorgeous and perfect and full of whimsy and dancing. Traveling to Nebraska, I found myself looking out the window with disdain. There really is, close to nothing, in that part of the country. We passed few gas stations, fewer still sites to see and things to do. You can imagine my surprise when I discovered a cozy local bookstore nestled between a gyro restaurant and an art store in downtown Lincoln. It was called A Novel Idea, and run by a generous and kind woman named Cinnamon. No, this is not off of Pinterest. I took this myself. It was one of the most delightful bookstores I have ever been in. They had two fat cats roaming around the bookshelves. Newspaper clippings on the walls revealed these cats were rescued by the owner and loved by all customers. 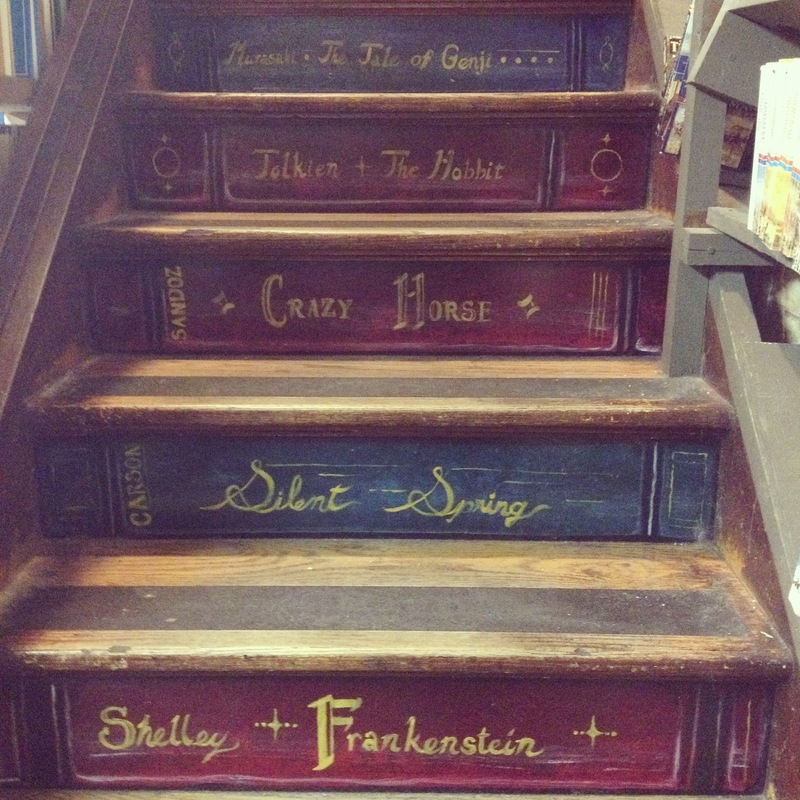 Along with this, the most literary savvy staircase I have ever witnessed can be found in this spot. The staff was lovely. When I asked staff member Eowyn Ivey what book she would recommend I read before I die, she responded with 5 different novels I never would have picked up myself. I ended up with 2 of the 5, Haunted by Chuck Palahniuk and a magical realism novel titled The House of the Spirits by Isabel Allende. “Give The House of the Spirits a good hour when you read it,” she said. And I will. I left that bookstore remembering what websites such as Amazon are missing: the smell of the pages as soon as you walk into a bookstore, the feel of the fuzzy cats on your legs as you search the shelves, and the camaraderie of knowing you are among your own people. People that love books, maybe more, than you do (but surely not). People that will show you the worlds they have found and loved. I’ve longed for this feeling since I left my college literature classes where we would talk about books and worlds everyday. 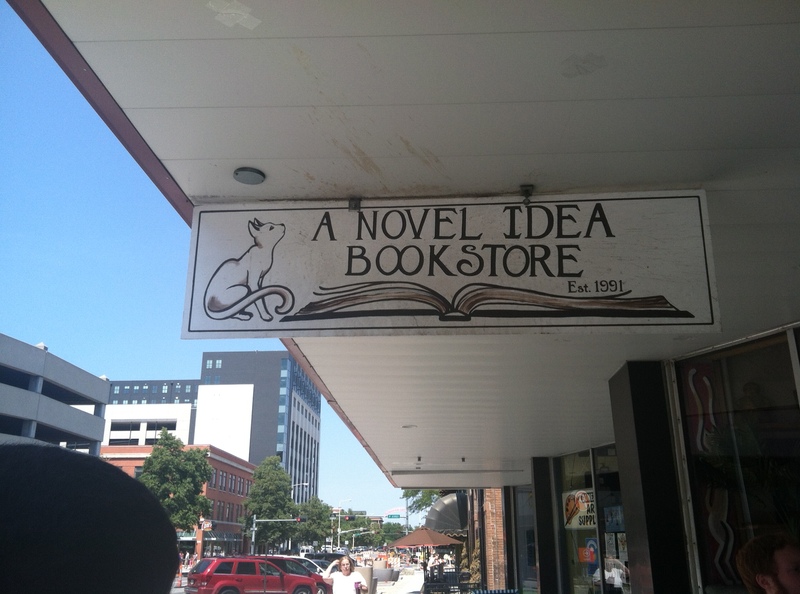 The nostalgic feeling of that bookstore stuck with me until my last day in Nebraska. I remembered the loved comments about a bookstore called Prairie Lights in Iowa from the 2013 In-Print guest authors at Ball State University, I can’t for the life of me remember who said it. Maybe Elena Passarello or Eugene Cross. On my way back home (which, for me, is Indiana) from Nebraska, I swung by to see what all the fuss is about. 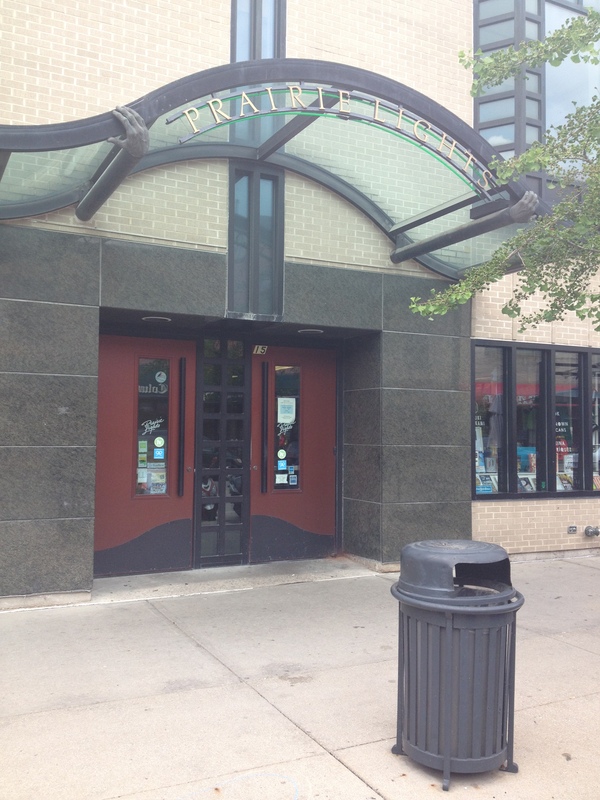 Prairie Lights has some serious curb appeal. Two dark wood doors against a silver building with an awning that says, “Hello, we have so much knowledge in here your brain might explode.” I mean, just look at it. HEY THERE SCHOLARS. Don’t mind the trash can photo-bomb. The people at this bookstore were not as hands on. This may have been because, I’m fairly certain, that weekend had been move-in weekend for incoming freshmen. I worked in a text/bookstore for a year, I wouldn’t want to approach any more nervous and frustrated students either. The important thing is, they were there when I needed them. And I did need them. After a while of browsing the crowded novels, I had a question itching in the back of my mind. I thought this seemed like a bookstore that would house Roxane Gay‘s new novel Bad Feminist. I had to ask or forever regret it. “I think we’re out,” a man with a ponytail told me over Dumbledore glasses. Disappointment crept across my face as the employee slapped a few fingers on the keyboard. “Wait, hold on,” he said. I turned my attention to the mystery books on sale, not letting myself hope. I had been itching to get my hands on a copy, but knew of few bookstores that had it. I know it is available online, but I wanted it in my hands at that very moment in the most selfish of ways. “Here you go. Fresh out of the box,” the man said from behind me. My excitement could not be contained. My delight echoed throughout the store, or that’s how it happened in my head. 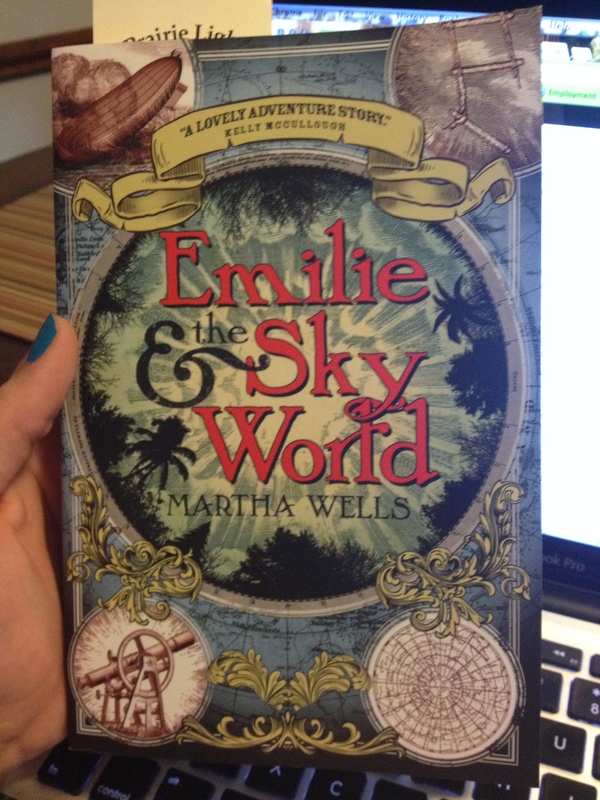 I purchased one other book here titled Emilie and the Sky World by Martha Wells, which has probably the most beautiful cover I have ever seen. I know this post is picture heavy, but just one more, I promise it is worth it. We hear stories all the time about bookstores closing down, big chains breaking, and an all around difficulty of the publishing industry due to things like Amazon and Kindles. I get it, books are are hard industry, they always have been. But with places like these laying in wait for book lovers like me, and probably you, to stumble upon, I don’t believe that electronic books could ever replace good old paper and ink. Or at least I am hoping beyond hope. It’s the people and the paper and the cats and the rustle of turning pages. It’s the personal touches and contact. It’s the palpable love for words. That make these experiences irreplaceable.